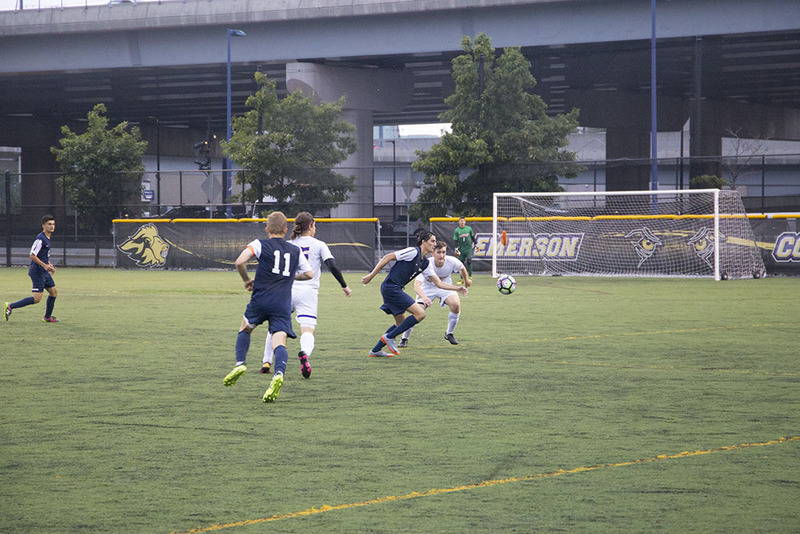 Emerson's men's soccer team will kick off College GameDay at Rotch, hosting MIT at 1 p.m. Saturday. Fans attending the Lions’ men’s and women’s soccer games will have an opportunity to play KanJam, corn hole, wiffle ball and other games for prizes, with the goal of drawing a crowd to support Emerson soccer on senior day. The event will also feature live broadcasts of both soccer season finales and the key women’s volleyball game in the Bobbi Brown and Steven Plofker Gym, which will pit Emerson against Springfield for the final NEWMAC playoff spot. Emerson Channel Sports will stream all three games on its YouTube page beginning at 11:45 a.m.
"It’s not often that senior day happens for three different sports at one day, so we wanted to show that,” Joe Jacobs, director of sports production for ECS, said. Student-Athlete Advisory Committee member Jill Gearin, a senior on the softball team, said two Emerson athletes will be leading fans from Piano Row to Rotch at 11:30 a.m. The volleyball team will also make the trek down Tremont Street following its match to be honored as part of the festivities. Jacobs, who plays baseball, said ECS and SAAC are working hard to promote Emerson College GameDay, and hope it can be a barometer for fan support of Emerson athletics. At press time, 84 people had responded to a Facebook event created by ECS. Jacobs said the broadcast portion of the event should be similar to ESPN’s popular college football pregame show, ESPN College GameDay. It will feature packages like senior tributes and previews of the upcoming basketball season, and include interviews with coaches and athletic department administrators, he said. Gearin said the broadcast portion of the event will also provide good training for aspiring commentators at ECS. “[It’s] a really cool experience for those guys-- it’s a very real thing that could happen to them in the real world, where they might have to help produce and broadcast something like this,” Gearin said. Jacobs said the idea is the brainchild of SAAC member and men’s soccer senior Niko Emack-Bazelais. SAAC members will help staff the events throughout the day. There will be prizes for fans who emerge victorious in some of the contests, and with forecasts calling for sunny skies, the list of activities also includes water gun painting. The athletic department will provide food and drinks, according to an ECS press release, and Jacobs said there will be a popcorn machine as well. Jacobs said he hopes something similar will be replicated in other seasons if Emerson College GameDay proves successful.